I’m not shopping these days, but I do LOOK at lots of things (as you well know!). So I decided to do some imaginary shopping; sort of walking through the process of what I would do IF I were in a shopping phase of my life. First up: What basics do I already have in my wardrobe that I wear a lot, and want to use as a basis for leveraging my purchases? Now, what do I want? I’ve chosen to splurge on red this shopping spree. It’s an on-trend bright color, but it’s dead classic, and never goes out of style. It’s a color I wear well, I already have a couple of beautiful scarves with a lot of red in them, and it mixes brilliantly with black. And the add-ons: a “top accessory” (i.e. something above the waist), and a pair of shoes. These are, for me, essential, because if I’m wearing the red pants with a black top, I want something red above the waist to tie the whole outfit together. (yes, a scarf will do this, but in the hot weather, I want an additional option to scarves) Similarly, if I’m wearing a red sweater and a pair of black pants, red ballet flats will make it look as if the red was a deliberate choice as part of an ensemble, and not just the only clean top in the closet! Love this! 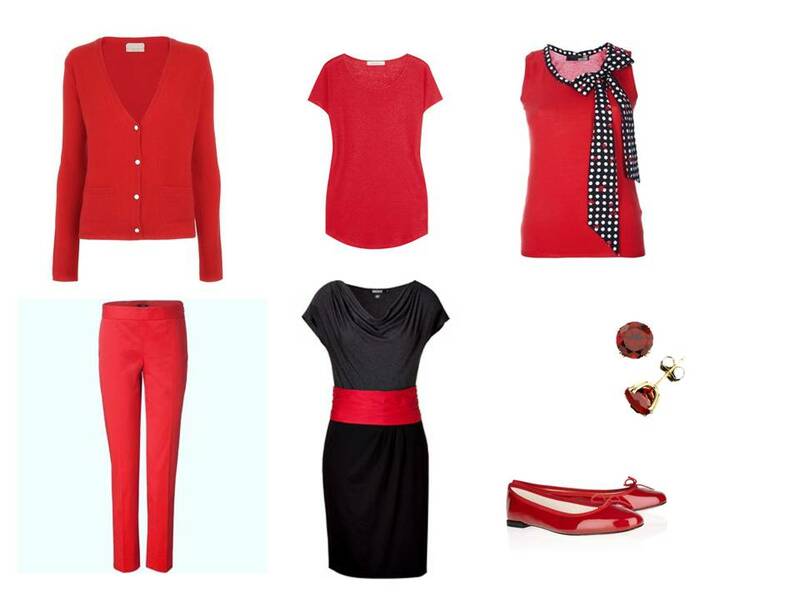 I adore red and I'm building this up in my wardrobe: red handbag, red coat, red loafers, red in scarves so far. I'm looking to invest in a pair of out-there (but in a good way) red cord pants for winter, once I figure out how to wear them. Love this! I have always loved red and as a winter its a good color for me. I was thinking that surprisingly I don't have much red in my wardrobe but when I actually looked I have more than I thought, well at least enough for a small capsule. I found a corduroy jacket, beautiful cardigan, bootleg jeans, sequin tennies, pretty sweater and a few other other pieces as well. I may have to try to put together my own mini capsule, lol. Red is my favourite punctuation to my black and grey basics. (That, and cobalt blue.) Love this one, Vivienne! I don't think I'd like pink shoes so maybe a patent ballet flat instead? I really like your rule that if it doesn't integrate 4 or 5 times into your existing wardrobe it doesn't go home with you. Those red repettos are so happy! I love, love, love red. Maybe my favorite of your posts ever! I love the pairings, espeically since just about everyone can wear some shade of red–a slightly orangey tomato-red works for me, for example, while true red or a reddish burgundy looks horrendous. Thanks so much for these wonderfully instructive and useful bloggings! Ah, MY colors! Black and white and red always makes me happy! Great Post! Brilliant post. I love how you made sure your new items remix before you purchase. Often I will shop with a list, but the list has items to complete one or two outfits. This is much better planning. Thanks for the idea! LOVE the recommendation about the accessories/colors above and below the waist. Perfect advice — and, while these aren't my colors — as always, the advice is wonderful. This seems so sensible – plan wardrobe purchases in advance – yet I never consider doing it. I think I've got the idea that if I want something very specific I'll never be able to find it, I just get frustrated going from store to store, give up and buy whatever colour strikes my fancy. Is it possible to PM you with a suggestion for wardrobe? You can always email me at theviviennefiles@gmail.com. Depending on my work schedule, it might take me a couple of days to get in touch, but I'm always thrilled to hear from you! Oh, this is wonderful! I just got back from being away for a week and tried your wardrobe template. I also accidentally wound up mixing navy and black…next time I will change the light in the closet before I pack! Many thanks for your time and ideas. More inspiration. I even have red repettos–will wear them tomorrow. Here's what I would like to see you do: a collection of accessories for people who don't have accessories–in other words, a starter set, an intermediate set, etc. How to get the most bang for the buck in the accessories area. I know you are busy! What nice inspiration and instruction on how to plan a wardrobe. It is never too late to start on a confident and consistent brand. I like seeing people wearing red and enjoy wearing it too. The garnet earings are fantastic. The red shoes are cute, remind me a little of the role "Mary" that Sandra Bullock played in "All about Steve" – cute, excentric, energetic, fun, thinking outside the box. I love red, and i definitely think I'll get myself a nice pair of Repetto soon 🙂 Thank you so much for the great inspiration! Sending buckets of appreciation and gratitude for each and every one of your thoughtful posts! I am longing for a break in busy days to sort out my closet and get going with a VF approach. the urgency to get a grip on the randomness and disorder is growing! How much easier and more fun it would be to have a collection of well chosen elegant ensembles. I ditto the request from Frugal Scholar re: building an accessory wardrobe…please add to your growing list of special queries. Again, thank you so much! Dorothy J.
Ditto the request for different levels of accessory wardrobes. Also, it would be really helpful if you could do one on accessorizing for real heat. In other words, how do you pull together a top and bottom for either professional, social, or casual wear when it's too hot for cardigans, jackets, scarves, and even necklaces. Even though you might toss in a cardigan or jacket for the possible overly air-conditioned space, you're not planning on having it on your person and it doesn't help as an accessory if it's hanging off a chair or rack somewhere. Sorry, off subject! I would be forever grateful to see a collection of ways to wear separates in a put-together, chic way without the usual go-to finishers (jacket, scarf, cardigan, big necklace). Think Miami or Houston in August, except that's the way you have to dress there for half the year and not just a month. What would a capsule and set of looks be if you assumed that the jacket/cardi was really a raincoat–and not in Seattle. You'll wear it some, but 80% of the time it's not in the picture. Just off the top of my head, I'm thinking about earrings… Maybe bracelets. Terribly hot weather is very difficult, you're entirely right, and I'm going to have to devote some serious though to how to handle it in a Timeless, Elegant and Classic way! Love your post, I have been for a long time, someone who purchased nothing unless it went with 2 things in my wardrobe, but when I get it home it is usually more items. It does make your wardrobe seem a lot larger. I'm new to this blog, and am learning so much. I notice that you have chosen red items from several different brands; is it important to exactly match shades of red (or blue, navy, brown, etc)? I find that it is difficult to match shades across different brands, especially when items are worn next to each other (cardigan and tee).